Our facility is located in Phoenix, Arizona. We’re a team dedicated to helping families preserve their most precious memories. We accomplish this by carefully and professionally transferring film and video to digital formats. There are many things about Got Memories set us apart from the other video and film transfer service companies. Mainly, our website is covered with excellent sources of education, mainly videos which you will see all over our site. These videos are there to show you how we transfer your home movies, whether you a box of old films that are a mix of 8mm, 16mm, and Super 8mm film stacked underneath that other big box of video tapes such as VHS, Digital 8, VHS-C and Mini-DV. 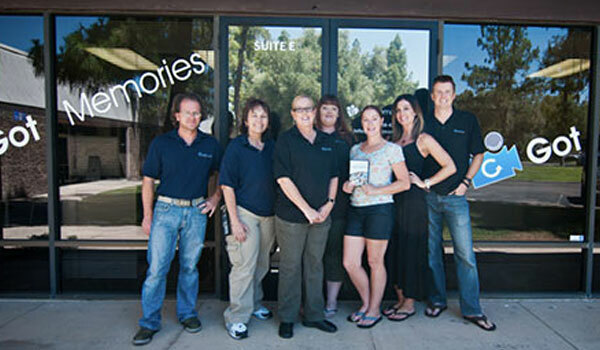 Our team here at Got Memories is the best in the business. Over 35 years of collective experience in the film & video conversion industry. So are those old shoe boxes of 35mm slides, print film, and printed photographs. And as they are getting older, they are getting more brittle. The original quality is fading away bit by bit until those precious memories that have been recorded will be gone forever. Got Memories is here so that you can do something about it right now. Send us your old originals whether it be video tape, film with sound, silent movies, home movies, 35mm print film, old photos and slides, and we will transfer it all into modern digital CDs, DVDs, Blu-Ray (or other formats as appropriate) that you can show, copy, and even edit to your heart’s content. Got Memories is set apart from the crowd of companies providing film and video transfer services of obsolete media into modern digital products. We do not outsource our work to anyone anywhere at anytime. Your precious originals are kept under lock and key in our modern climate controlled secure facility that uses closed-circuit security cameras and alarm systems. Your original media will not be sent overseas where the horror stories abound from customers who have used such services. Stories of precious originals being lost forever. We treat your originals as if they contained our own precious memories. We use the most modern commercial transfer equipment available anywhere, and we have built-in redundancy to eliminate any downtime. Even if one of our commercial machines should need to be taken offline for repair, we have others still up and running. Our transfer equipment is capable of doing everything from the smallest job to the largest commercial transfer of obsolete media to digital format. Our transfer and conversion services are done on-site at our Tempe, Arizona production and retail facility. We turn out the highest quality work every time without exception. Our highly trained and knowledgeable staff are experts at scanning and digitizing originals that are in practically any condition to produce a quality digital product for you to enjoy. We can also convert video that has been recorded in foreign formats such as PAL (Phase Alternate Line) used mostly in Europe to NTSC (National Television System Committee) used mostly in North & South America and Japan. So send us those old originals so that we can bring them back to vibrant life in a modern digital format. Send us your old Kodak Carousels of slides, those old photographs of vacations, birthdays, and Christmases of time past. Don’t let the memories fade that are on those old movies on film, camcorder tape, video cassettes, video tape, slides and prints. Got Memories can make all of those memories fresh again for many generations to come. 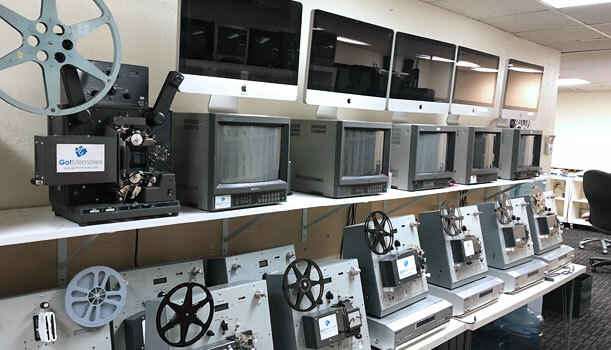 Our team features experienced digital transfer technicians who know how to properly use equipment and preserve original film and tapes. What’s more, our staff takes pride in each and every transfer job. All of the equipment we use for film and video transfer is designed to protect your originals while producing a perfect replica of your family memories. Learn more about our process. All of our services come with a 100% satisfaction guarantee. If you’re not completely satisfied with our work, let us know, and we’ll work to make things right.